Inline steam jet heaters optimize the condensing of steam into operating liquids to provide efficient fluid heating. They essentially are jet pumps, and as such, operate on the principle of one fluid entraining a second fluid. Inline steam jet heaters have three common features (designations may vary according to design): inlet, suction and discharge. Inlet – The operating liquid (some-times called the Motive) under pressure enters the inlet and travels through the nozzle into the suction chamber. The nozzle converts the pressure of the operating liquid into a high velocity stream, which emerges from the discharge side of the inlet nozzle. Suction – Pumping action begins when steam in the suction chamber is entrained by the high velocity operating liquid stream emerging from the inlet nozzle, lowering the pressure in the suction chamber. The resulting action causes the steam in the suction chamber to flow toward the discharge. Discharge (sometimes called Outlet) – The entrained steam n the suction chamber mixes and condenses into the operating liquid and acquires part of its energy, flowing into the parallel section. In the diffuser section, part of the velocity of the mixture is converted into a pressure greater than the suction pressure, but lower than the inlet pressure. Inline stream jet heater operation Several types of Steam Jet Heaters are available. 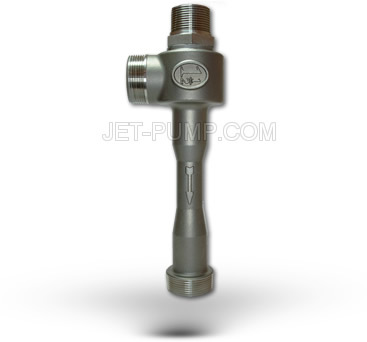 Although their designs vary, the operation of each is based on the jet operating principles of the jet pump. Steam Jet Heaters operate by condensing steam into the liquid that is being heated. The process ensures a complete transfer of the BTUs in the steam to the liquid. The steam gives up its BTUs as it condenses into the liquid. This also dilutes the motive liquid with the condensate. Eductor liquid heaters function under the normal principles of eductors. In actuality, the process is that of a liquid pumping a gas. The only thing that differs with pumping steam as a suction fluid is the increased affinity of steam for cold water. Because of this affinity, a greater volume of steam is pumped under the same conditions. Also, in some cases, the BTUs being released allow the unit to discharge to higher pressures than either the motive or the suction pressure. In line steam Jet Heaters utilize the principal of direct injection to mix steam with a cold liquid uniformly. Operation is efficient because the heat in the steam is absorbed by the liquid being heated to approximately 10% of liquid saturation temperature. The jet action produces agitation and circulation, eliminating the need for other equipment to accomplish these functions in most applications. In operation, jet heaters use steam (or steam and water under pressure) as the motive force to entrain, mix with, heat, and pump (or circulate) the suction liquid. They have no moving parts, nothing to break or wear. There are no packing glands. Installation cost is low because they are compact and no foundation or wiring is necessary. They provide reliable operation with low maintenance cost. There are numerous possible applications for Steam Jet Heaters. Heaters are available for heating liquids in line or in a tank. Steam Jet Heaters are commonly found in these industries: food processing, petroleum, dairy, manufacturing, chemical, distilling/brewing, and others. Specific applications for inline heaters include: circulating cleaning solutions, pasteurization, producing scalding sprays, sterilization, heating water, blanching, exchanging heat, degreasing, heating slurries, laundering, cooking, pickling, bonderizing, quenching and tempering. Specific applications for open tank heaters include cooking grain, cooking mash, cooking starch, heating and circulating, mixing.